Built in Aromatic Red Cedar, this picnic table was milled for a smooth finish. Our 6' Amish picnic table is also available with outdoor sealer for an additional cost. Additional color combinations for the poly vinyl picnic table are available upon request for an additional fee. - Standard with Umbrella Hole and Umbrella Stabilizer Block to prevent your umbrella from twisting and turning. Use the drop down boxes shown top right to select options for your Amish poly lawn furniture order. Built in Aromatic Red Cedar, this child's picnic table was milled for a smooth finish. This kids' wooden picnic table is also available with outdoor sealer for an additional cost. - Standard without umbrella hole. - Ships via FedEx Ground in 1 box; some assembly required. 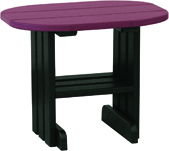 This octagon wood picnic table has a convenient design. With the table and benches in one piece, it helps a yard stay neat. Yet the four benches have spaces between them so you can easily seat yourself. An umbrella hole completes this large picnic table. The bold lines and warm stain of this coffee table give your space a rustic look whether outdoors or at the cottage. This rustic wood end table finishes your patio or cabin with a touch of beauty. *Available in White, Black, Chestnut Brown, Weatherwood, Green, Red, Tangerine, Yellow, Lime Green, Blue, Aruba/Blue, Dove Gray/Slate, Dove Gray/Black, Cedar/Black, Weatherwood/Chestnut Brown, Weatherwood/Black, Green/Black, Cherrywood/Black, Red/Black, Tangerine/Black, Yellow/Black, Lime Green/Black, Blue/Black, Aruba Blue/Black, Red/White, Tangerine/White, Yellow/White, Lime Green/White, Blue/White, Antique Mahogany and Antique Mahogany/Black. *Available in White, Black, Chestnut Brown, Weatherwood, Green, Dove Gray/Slate, Dove Gray/Black, Cedar/Black, Weatherwood/Chestnut Brown, Weatherwood/Black, Cherrywood/Black, Red/Black, Tangerine/Black, Yellow/Black, Lime Green/Black, Blue/Black, Aruba Blue/Black, Red/White, Tangerine/White, Yellow/White, Lime Green/White, Blue/White, Aruba Blue/White, Antique Mahogany and Antique Mahogany/Black. This 4' round table is small enough for romantic dinners and durable enough for dinner outside with the kids! Scratch resistant and rust resistant, it's a long-lasting piece! 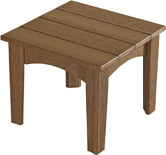 Amish craftsmanship combines durability with beautiful style in the silhouette of this weatherproof table. Great for large family gatherings or parties, the Poly Vinyl 4x6' Table is durable and 100% stain resistant to provide long lasting enjoyment. Serve your friends in style with a chic poly bar table. The careful silhouette welcomes all who sit at this table. At the end of the day, the material makes cleaning up easy. Poly Vinyl Coffee Table is a perfect addition to any set. Longer than the end table it is scratch resistant and maintenance free! This round table works with many senses of style. It is the perfect centerpiece to an outdoor gathering and even has a useful bottom shelf. *Available in White, Black, Chestnut Brown, Weatherwood, Green, Red, Tangerine, Yellow, Lime Green, Blue, Aruba Blue, Dove Gray/Slate, Dove Gray/Black, Cedar/Black, Weatherwood/Chestnut Brown, Weatherwood/Black, Green/Black, Cherrywood/Black, Red/Black, Tangerine/Black, Yellow/Black, Lime Green/Black, Blue/Black, Aruba Blue/Black, Red/White, Tangerine/White, Yellow/White, Lime Green/White, Blue/White, Antique Mahogany and Antique Mahogany/Black. A chic end table will hold your things for you while you are enjoying your time outside. Ships via FedEx Ground in 1 box; some assemby required. The Poly Vinyl End Table provides a great place for those things you want near while you're hard at rest. This octagonal table is both stylish and practical. The table comes with an umbrella hole (plugged) and stabilizer block to prevent your umbrella from twisting and turning, umbrella sold separately. This table is maintenance free and will seat 8 people. 3 boxes delivered by common carrier; some assembly required. Take the bar with you. The great outdoors is too big for you to confine your entertaining to the same place every time. This poly vinyl bar has two shelves and is a great match for our bar stools. Best of all are the long-lasting, easily cleaned surfaces.